A USB data logger is for recording data such as temperature and humidity. Downloading of the recorded data is by connecting to a USB port of a computer. These USB temperature loggers have USB interface for downloading the recorded data. The product explained in this article is USB temperature data logger, which can record temperature. This is for usage in cold chain management, life sciences, pharmaceuticals, food industry etc. There are two types of USB data loggers. The first one is disposable USB data logger. Another terminology for this data logger is single use USB data logger. The customer can use this only once and after completion of the recording, customer cannot reuse it. The main application is to use in transportation of medicines, food, blood etc. The second type is multi use USB data logger. We can use this USB temperature logger any number of times. In this case, after the recording, we can download the data and reuse any number of times. There are two categories available in this series. The first one is for recording only temperature. The second one is for recording temperature & humidity. This is a plug and play device, which can download the report without any special software. It will generate three reports viz. Microsoft Excel, Adobe pdf & Text reports. When you insert the USB data logger into a computer, it acts as a USB memory stick and you can see all the three reports inside this drive. There is a start and stop button for starting and stopping the data recording. There are 5 LEDs on the USB temperature logger to show various alarms. It has a capacity to record 7928 readings. The customer can program it as 15 days recorder, 30 days recorder, 45 days recorder, 60 days recorder, 90 days recorder etc. Customer can decide the programming interval and the total duration of recording. If you want to record the temperature every 5 minute, it will last for 27 days. If you record every 10 minutes, the recording will last 54 days and so on. The data logger will generate reports automatically in pdf, Excel and text formats. If you do not have pdf and excel software, you can still see the report using the notepad software, which is freely available. 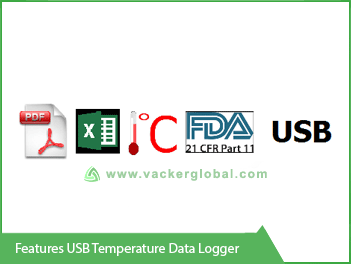 This USB Temperature data logger complies with regulations of 21 CFR part 11. These USB temperature loggers are reprogrammable up to the first use. Alerts displayed by the LEDs on the USB temperature data logger. If the first Red LED above green LED is active, this means that the temperature exceeded the first high alert level. If the second Red LED above green LED is active, this means that the temperature exceeded the first and second high alert level. If the first Blue LED below green LED is active, this means that the temperature went below the first low alert level. If the second Blue LED below green LED is active, this means that the temperature went below the second low alert level. This model of USB temperature logger has an inbuilt calibration report. While you insert the USB data logger and generate recorded temperature report, the last page will show the calibration report of the same device. This calibration report is traceable to NIST. This is a 3 point calibration certificate. If your customer at the receiving end wants a calibrated data logger, this model can be used. This is the next generation of the above model of USB temperature logger, which has an LCD display. You can see the following details in the LCD screen. Highest and lowest readings recorded. Duration for which the highest and lowest readings were recorded. Similar to the previous model of USB temperature logger, we have two models regarding the calibration report. This model has a NIST traceable calibration report. Three point calibration report is carried out on each data logger. These kind of USB data loggers are bigger devices with LCD display and bigger memory capacity. This has more features than the previous models. You can use these multiple use temperature data loggers any number of times. This model is only for recording temperature. Please click to read more on these loggers. These are similar to the previous data loggers. But this USB data logger will record temperature and humidity. The previous model was for recording only temperature. Please click to read more on temperature & humidity loggers.